I am patient when searching for the truth, aware that many forces can shape a person’s perspective: the need for a paycheck or an emotional tether, the offer of a ride on a political barge…an open wound, an exit from controversy. The possibilities are endless and it was with that single fact in mind that I struggled to present a judicious approach to the plight of the Nevada mustangs in last month’s piece, “Nevada Desert Drought and Our Vanishing Mustangs.” Privately I lamented that I had not personally encountered the mustangs, a fact which both restrained my commentary and further compelled me to write the piece because throughout my travels with my husband in the Nevada desert the absence of a mustang sighting has remained a notable void in our journeys. Until last week. Last Wednesday morning my husband and I set out for Rosebud Canyon, a favorite destination in the Nevada desert. We had previously identified the overall goal of our journey as an opportunity for my husband, who has been working hard hours of late, to relax. Rosebud Canyon is a place he immensely enjoys. And it is a relatively easy destination for us because we are familiar with the route and find it unproblematic. The temperatures hovered in the high 80’s. My husband and I packed a cooler with water and sandwiches, loaded the dogs into the Land Rover, and left for Rosebud Canyon. 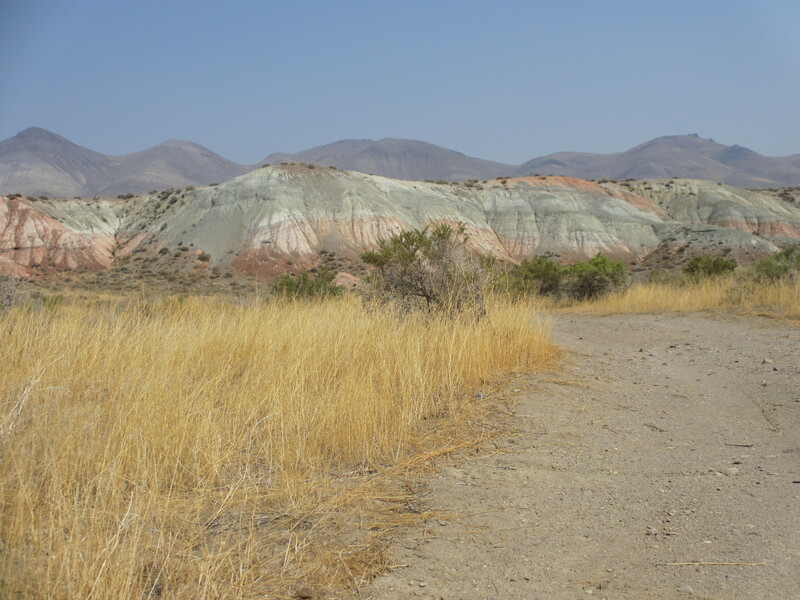 From our departure point near Imlay, we drove 35 miles over dirt roads into an isolated area of the Nevada desert. Smoke from wildfires produced pods of indigo in the desert sky and an uncommon painterly effect on my photographs. After eating our lunch in Rosebud Canyon, we decided to continue around the corner past Rabbit Hole Spring and out toward the Black Rock Desert Playa. 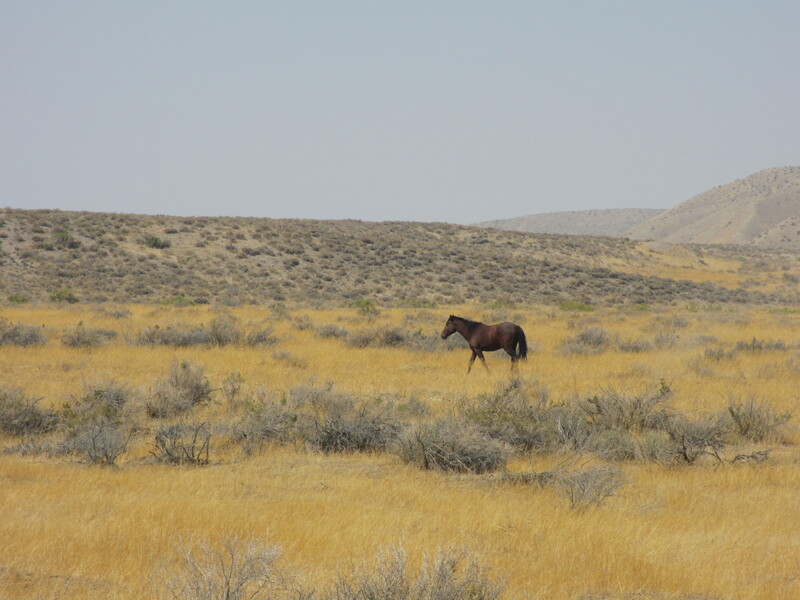 No sooner had we rounded the bend than we spotted our first mustang, a young stallion, grazing. Within a few minutes he began to move at a deliberate pace across the meadow and into the foothills, from which descended another stallion with two mares. The stallions engaged in a vigorous conflict, apparently over the mares. The young stallion, defeated, drifted back across the meadow. As we followed him with our gaze we observed him proceeding toward a few other mustangs which by then also grazed in the meadow. He didn’t join them but remained at a bit of a distance. Eventually we ambled onto the Black Rock Desert Playa and after completing a small navigation exercise, circled back toward the meadow and Rabbit Hole Spring. We reentered the canyon, only to be confronted within a short distance by an enormous black stallion. Although we couldn’t be certain of the count, it appeared that he was accompanied by four or five mares and two foals. We wondered at the appearance of all of these mustangs. We have visited this region many times during the past three years and in various seasons, and have never seen them before. I speculated to my husband that perhaps they were surviving fragments of the early summer round-up by the U.S. Bureau of Land Management in the Jackson Mountains. 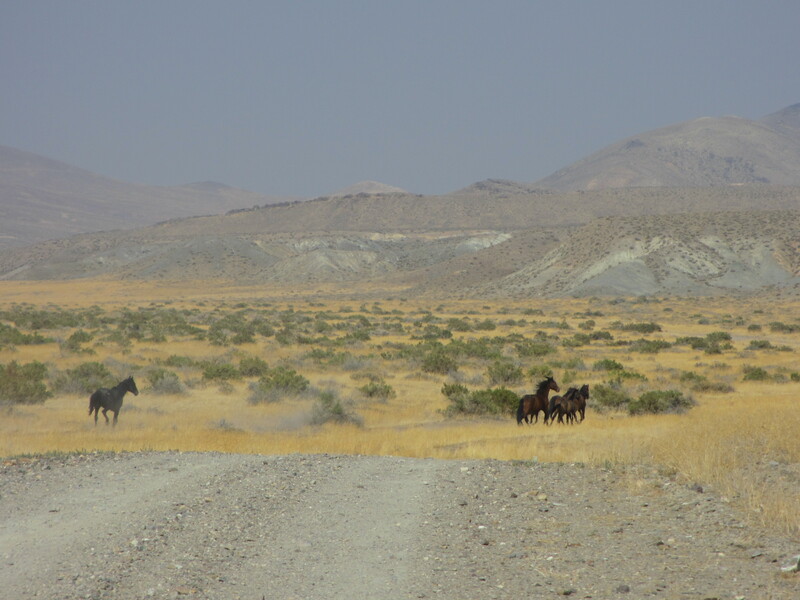 In the canyon, the mustangs declined to yield the road over which we had to pass to return home. As we crept forward for about an hour, we were mesmerized in particular by the enormous and exquisite black stallion which alternately grazed and traversed the road ahead of us, marking his territory in proud defiance. He did not seem intimidated by us and we were careful to make no sudden or broad movements. When the wild horses did exit the road and we parted ways, I was left to reflect on the BLM’s drive to remove these wild horses from the range, claiming the mustangs’ imminent sickness or starvation as partial justification for their actions. Admittedly I am not an equine expert and what I witnessed with my husband was simply a snapshot in the long and complex lives of these wild horses. But to me it appeared to me that what we saw was a picture of health. Those are beautiful photos – love that first especially. Hi Donna:) Thank you. I was really blessed in that I was using a point and shoot which can be pretty ineffectual in the midday desert sun but fortunately the smoke helped to mitigate the infusion of light. The pictures make me travel and your comments make me realize how wild and distant these horses and that landscape are from the world I know. My husband and I feel blessed whenever we have the opportunity to spend time in the Nevada desert, and witnessing a few hours in the lives of these horses was a truly humbling experience. love your thoughts and words viv.this one really hit home.by the grace of god..
Hi Cheshire, Thank you so much…the world of these wild horses is wonderous…we were blessed to see them in their native habitat. How are things coming along with your plans? well hi viv.ive made a few.some doing rough.some still in the works.it has something to do with the wild nevada mustangs actually.im going for a grant…cant tell u more right now will know next week.if it happens we will be right up your alley.until then i have to wait n see.im glad to hear from you,thanks for stopping by.take care. Thank you for your visit and for sharing in our journey. My husband and I were profoundly moved the time we spent in the presence of these horses. Yes, they are everything you have described. Do your Brumbies live in the desert? Do you travel far to see them?. Yes we have Brumbies in our outback however I am not that familiar with the desert here…yet! 😉 They are also found spread across the Blue Mountains. Whenever I hear the word Brumby It takes me back to a beloved childhood movie “The Man from Snowy River” based on the poem of the same name by famous Aussie poet Banjo Patterson. Here is a link if you want a little read http://www.middlemiss.org/lit/authors/patersonab/poetry/snowy.html. The movie was emotional and filled with the rugged landscapes of Eastern Australia. I hope you have heard of it, if not I hope one day you get to enjoy it as I have many times. Thank you for stooping to look at my blog. Blessings to you! Thank you for the link! I am not familiar with the film but I will look for it. What a lovely childhood memory. Awesome, what beautiful horses & their flying manes! This post reminded me of the movie: Spirit: The Stallion of Cimarron. I adore that movie & all its OSTs by Bryan Adams. I’ve always loved & admired horses, especially the wild ones. It’s such a treat to watch them run & gallop in the wild, they’re like ‘freedom’ personified (rather animalified 🙂 ) Loved this post! Thank you for your lovely comment. Seeing these horses was a life-changing experiience for my husband and me. These days my heart is deeply troubled because I have become aware of new developments which will have further adverse effects on the future of our wild horses. I have never considered myself an activist per se but I am asking God to make me an instrument of His will, to show me how in any small way I can help these horses. Well, thank you listening. I know you would be as moved as I by the sight of these horses. I’m not familiar with the movie but I’ll definitely look into it. If you like it, it must be a gem. Is everything okay with you? I have been putting off reading some of the posts but I will soon sit down and read and digest all of them. My heart is so heavy with the news of these developments surrounding the future of our wild horses. doin ok.autumns so beautiful here in northern michigan cant get enough..been busy too.take care. The horses remind me of my uncle’s in Sumbawa, they are wild and strong. Thank you for sharing these pictures. They are lovely. Those horses look very healthy! From what I’ve seen, the mustangs North of Sparks/Reno are fatter, than the ones further South. Where we (the humans) crowd them, they tend to be leaner. It’s such a blessing to see them like this, a picture of health and freedom. These horses are splendidly fat! They seem to be finding plenty of forage, which makes it all the more puzzling and disconcerting that the BLM removed so many from this area. I’ve seen photographs of wild horses from all over the west. By appearances these are among the healthiest. I do so hope that they will remain free and thriving.